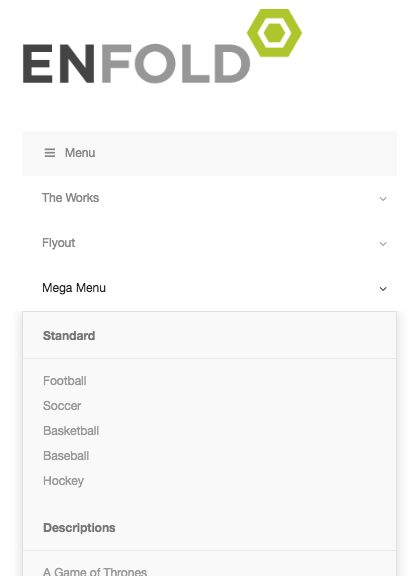 Enfold’s menu styles will break UberMenu due to residual styling. First we’ll replace the theme’s menu with UberMenu to eliminate the residual styling. Then we’ll set up some configuration settings as well as add a few special styles. If you are using a current version of Enfold (any version 4.1.3 or later), Enfold has added a filter that makes integration much easier. You should always make theme changes in a child theme. To get started with a child theme, you can Download the Enfold Child Theme. Note that you will want to import the parent theme settings once you install the child theme as described in that article. In your child theme’s functions.php, paste this code at the end of the file. Make sure it is before the closing ?> PHP tag, if you have one. This code replaces the Enfold menu with UberMenu. Since the Enfold search won’t be compatible, we’ll remove it by adding this code in the child theme functions.php. You can add in an UberMenu search bar instead. You may also be able to disable this in the settings, instead. For the best similarity to the default Enfold styling, the Vanilla skin is recommended. These styles help the visual integration, though you may need to adjust them for your specific configuration, since there are many permutations of the Enfold header. These are just example styles, you may or may not need each for your specific setup, so we recommend testing them out. Keep in mind, you may need to re-enable this if you are editing an Enfold-specific menu. To eliminate this residual styling, a change needs to be made in the helper-main-menu.php file to replace the theme’s menu with UberMenu. Start by copying enfold/includes/helper-main-menu.php into a child theme (the path will be enfold-child/includes/helper-main-menu.php). Always make your changes in a child theme to preserve them when the parent theme is updated. You can learn more about the Enfold child theme and download a starter child theme here: Download Enfold Child Theme. Note that you will want to import the parent theme settings once you install the child theme as described in that article. We will replace the entire .main_menu block. Note that some of the theme-specific menu features will be removed, so you can add in the UberMenu versions afterwards. Since the Enfold search won’t be compatible, we’ll remove it. You can add in an UberMenu search bar instead. If you want to use UberMenu in Enfold’s Secondary theme location, you will need to Manually Integrate UberMenu to prevent the theme from interfering with UberMenu in that theme location. The edit can be made in the helper-main-menu.php template in your child theme (make sure to keep in in the /includes folder) and replacing the entire #header_meta with UberMenu. You can get the exact ubermenu() function from your Control Panel, and note that you may want to create a secondary UberMenu configuration to control this menu independently. If you want, you can set an inner menu bar width and center it to set the menu items aligned to the edges of your content area.